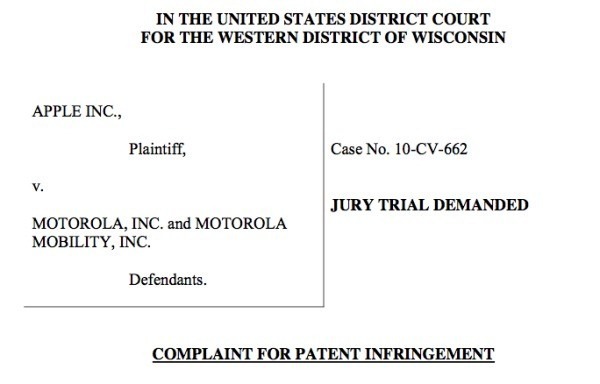 At the beginning of the month (October 6 to be exact), Motorola sued Apple for infringing 18 of its patents, including ones as diverse as antenna design and multi-design synchronization. Of course, being a company run by El Jobso himself, Apple just couldn't help it - they just had to strike back. It's not surprising to see Apple re-enforcing its scrolling patent (that would be patent #7,497,949) yet again, and since the company filed the cases in the Western District of Wisconsin (a court with a reputation for being nice to the plaintiffs), Motorola might be in deep with the sharks here. Perhaps an even graver problem is that, seeing as most of the above patents are related to the Android OS, it can't be long before Google and Apple have to fight it out at a level more meaningful than a public war of words.